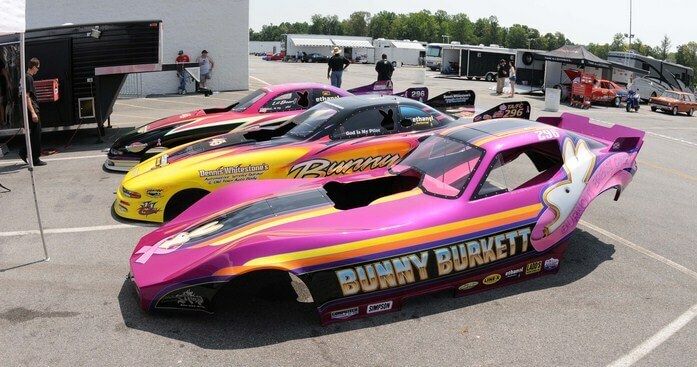 Carol "Bunny" Burkett, “Miss Universe of Drag Racing”, a living legend! Carol “Bunny” Burkett, “Miss Universe of Drag Racing”, a living legend! Carol “Bunny” Burkett is one of the pioneering figures and most successful drivers in the history of drag racing. In 1964, at Old Dominion Dragstrip, in Manassas, Virginia, Bunny won her very first race and never looked back, quickly emerging as the first truly competitive female drag racer on the east coast. In the late ‘60s and early ‘70s, she established herself as one of the most popular drag racers in the country, traveling thousands of miles a year, from Canada to the Carolinas and from Nashville to Maine. By the mid-‘70s, Bunny was successful enough to move up to Funny Cars. In 1986, she was the International Hot Rod Association’s [IHRA] Alcohol Funny Car world champion, making her the first (and until 2008 she was the only) woman to win a championship in a Funny Car. In 1995, Bunny almost lost her life, during a race in Pennsylvania, when her opponent crossed into her lane, hit her car, and caused it to rocket off the track and into the woods at over 200 mph. Doctors told her that she’d never walk again, but, after 18 months of recovery and rehabilitation, she was back to racing her Funny Car. Amazingly, Bunny Burkett will turn 70 years old this year. She’s ready to race and the tracks are completely geared up for her 50th anniversary tour. “Retiring is just not in my vocabulary,” she laughs. Here she is doing a spectacular burnout as a warm up for the upcoming race in 2010! Hydraulic pumps – different types and purposes explained! 2016 Honda NSX – Driving fast and roaring like a beast!